There was a time when I was new to blogging around 7 months back and was new here.Now I have so many blogger friends and learnt so many things in blogging.Today I feel very happy to be awarded the Inspirational blogger Award which was given to me by Ms.Wan @ Cooking Varieties .She is from Kuala lumpur,Malayasia ; a great blogger ,a great friend.Her interests are compiling recipes and writing /publishing cookbooks for the Interational market.She has always supported my blog through her comments and her comments are always an indepth learning to the post.I feel inspired reading through her comments.As a token of regards,I would love to give her the thank you card for the inspirational blogger award. 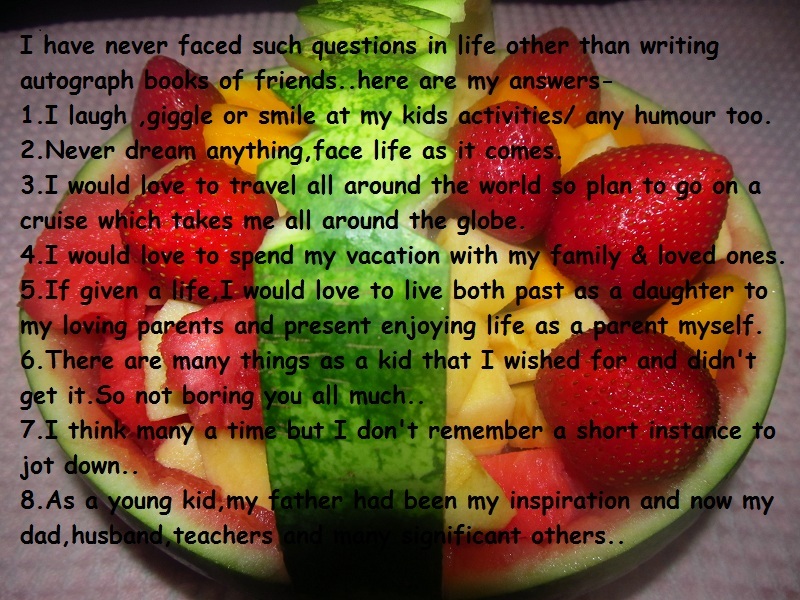 The inspirational blogger award is got a very lovely thought of answering 8 questions regarding you as a person and a sweet award too..
5.If given a life,what life would you choose ? Your life now or your past? 6.Is there something that you wished before when you were young but you didn’t get it? 8.Is there someone in your life who has been your source of strength and inspiration? I would like to pass it to the following bloggers who have always inspired me through their innovative ideas,awesome clicks ,beautiful posts and also helped me to reach this stage in blogging .Please visit their space if anyone is left out ! 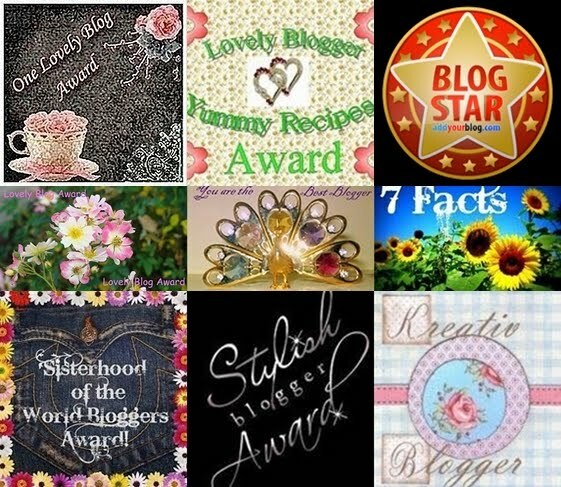 !So,Friends grab the lovely inspoirational blogger award and please answer the questions accompanied by the award.Copy and paste in your space,feel proud of it!! 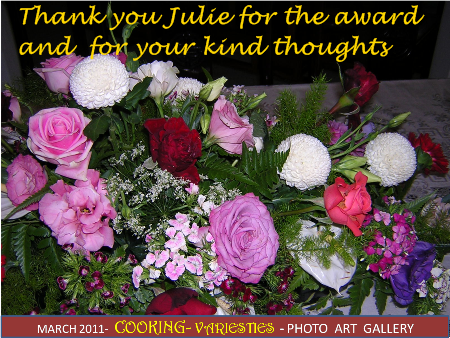 I recieved this 'Thank you 'card for passing Ms.Wan (cooking varieties) the hundred hearts award.Thank you Ms.wan ,as I never had anything like this before. 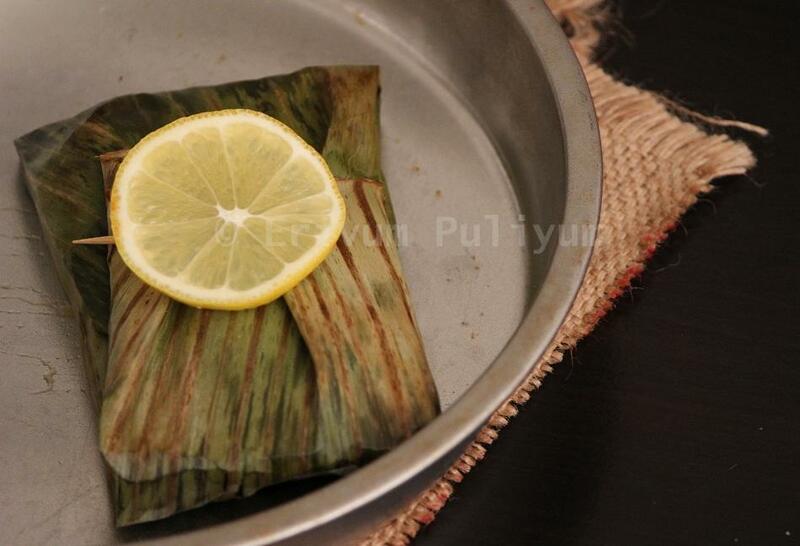 Today I have a delightful recipe of Kerala,very loved one- Meen Pollichathu / Baked fish in Banana wraps.Baked Fish in banana wraps / Meen Pollichathu is a common delicacy of Central Kerala in India.Usually its Karimeen / pearl spots which are wrapped in banana wraps and baked with a tasty masala mix.But we can replace pearl spots with tilapia/pomfret/ salmon fillets too.The taste may be a little milder compared to pearl spots but we loved it !! 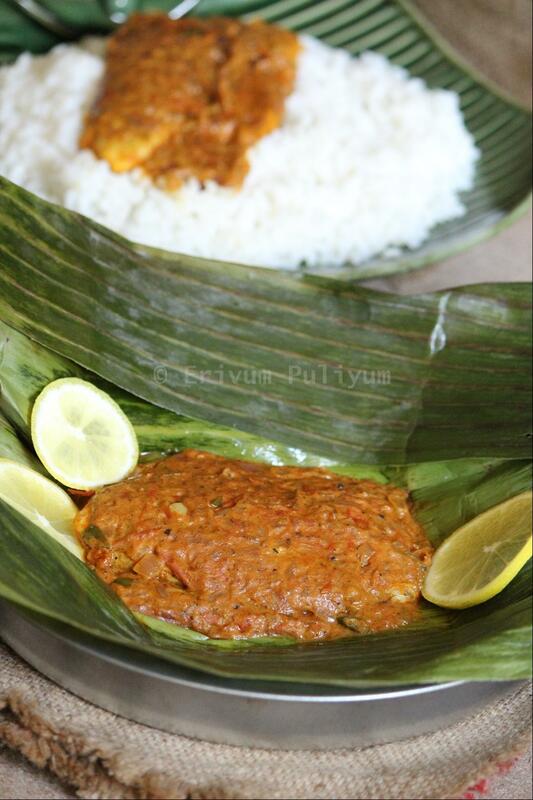 The toddy shops in kerala serves the best recipe of this.There are mainly three steps involved in this recipe .The marinated fish is first carmalized in a shallow pan with oil ,the masala mix is prepared in another pan and finally layered into the banana wraps and sealed thoroughly and cooked again in a a covered non stick pan or oven.Though there is more effort but the final result is awesome !! -Wash and clean the tilapia or pomfret or salmon as per desired using salt and lime juice. -Cut gashes on the fish if its with the bone,otherwise if using fillets no gashes required. -Marinate the fish using ingredients listed under marination and place it in refrigerator for 3 hours. -Heat oil in a non stick pan and shallow fry the fish for 5 minutes each on both sides,till its caramelized. (no need to cook thoroughly)Keep aside on a paper towel. -Heat oil in the same pan ,splutter mustard seeds. -Add in the chopped onion ,saute for 5 minutes. 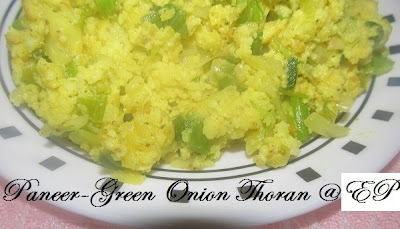 -Add the green chillies,curry leaves and tomatoes. -Cook the tomatoes till mushy. -Add the spices and give a quick toss. -Lower the flame and add the coconut milk ,keep stirring till the masala thickens.Put off flame. 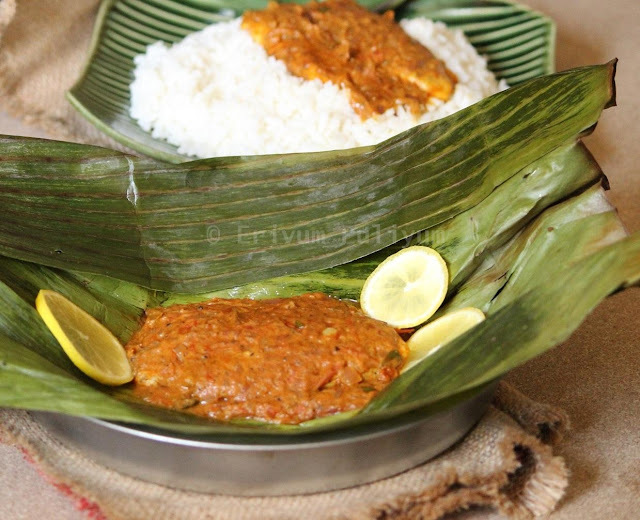 -Clean a banana leaf / foil and add the masala mix ,then place the caramalized fish and add another spoon of mix on top so that its covered completely. -Wilt the banana leaf on a stove top so that it is easy to fold and wrap. -Pre heat oven to 350 degrees and place it in a baking tray ,bake for 20 minutes. -You can find the leaves get browned and shrink so I have not displayed it here,rather used a fresh leaf to place the baked fish. -Serve hot with lemon wedges and sliced onion. The word 'Manchurian' itself waters many of our mouths,whether its the gobi manchurian, chicken manchurian or any other variety form.Iam also a big fan of manchurian and same with my family.Kids eat slightly more that day .Very familiar Indo-Chinese appetizer and an important dish in any party.But friends,yesterday I didnot have chicken or cauliflower at home and I badly wished to try it out.The prawns were ready at hand and so innovated with this recipe.I used the prawns with tail on.So,here comes the prawns manchurian.This also tastes equally good and yummy !! Marinate the prawns with the mix and keep it in for 4 hours. Heat oil in a skillet and shallow fry the prawns on medium heat,till light brown .Place it on paper towel. Saute the ginger garlic paste till the raw smell vanishes,Add the chopped capsicum,onion and saute till transparent. Saute for a minute and add all the sauces. Mix the fried prawn pieces to it. The gravy thickens,adjust salt and serve. -I prefer shallow frying,you can use the deep fry method if the quantity is more. 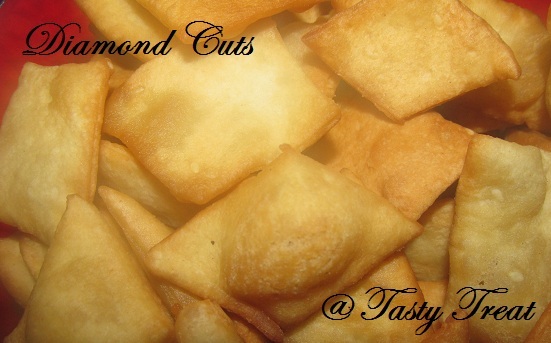 Diamond cuts as the name suggests is the diamond shape of this crispy snack.This is a common flavour from the state of Kerala,God's Own country in India. This is much relished during Christmas time at our place.Grown ups and kids all love to munch this snack any time.Its deep fried in oil and can be preserved for days together in air tight containers.This is a simple ,easy snack and can be prepared even by beginners. The traditional recipe uses maida (all purpose flour)as the base but here I used wheat flour as a part of being healthy.If you are using maida,then you needn't add baking powder.The dough can be left for 3 hours before rolling.Also,the actual part of recipe dusts the diamond cuts with confectioners sugar at the end.I have made the previous pic with wheat flour and adding sugar to the dough.But the latest pic below,is made with all purpose flour and wheat flour,coated with sugar syrup. Sieve the flour and mix the dough with salt and baking powder if using. Beat the egg, mix the powdered sugar and cardamom powder ,sesame seeds. Mix this into the dough and knead the dough like as for chapati. Keep it for 4 hours covered with a plastic wrap or muslin cloth. Sift flours and add salt to taste.Add the cardamom powder and sesame seeds.Add in the egg and add water as required to knead the dough like for chapathi. Keep covered for 3 hours. Pinch out large balls and using a rolling pin make a very thin chapati . Using a knife/pizza cutter cut diagonally on the rolled dough to make small diamond shaped pieces. Heat oil in a wok/ kadai upto 3" deep and wait till its hot. Slide the diamond pieces into oil carefully so that no spillage occurs. Flip all sides to get uniform heat and browning,keep on medium flame (else they become spongy and not crisp). When the diamond cuts start ringing ,drain using a slotted spoon when it turns slightly brown on a paper towel. Repeat the same procedure of rolling till the dough ball finishes. If the dough is mixed with sugar then can be stored once cooled in containers.If it needs to be coated with sugar syrup then proceed further. Heat sugar and water listed in a pan until it reaches one string consistency.Add cardamom powder and then slide the fried diamond cuts,mix well.Switch off flame.Wait to cool down before storing or serving. *If the dough is mixed with sugar ,then keep the flame low as it turns brown very fast while frying. 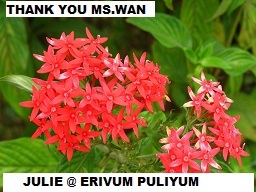 Hi,friends this is for your information n hope you have noticed ,I have changed my blog's name from 'Tasty Treat' to "Erivum Puliyum".That's a malayalam word meaning spicy n sour.Hope you find my recipes suiting to your tastes and every valued suggestions are counted from my readers.Hope to have your continued support as always,Thanx a lot !! A very familiar recipe and a very loved recipe with the king of fruits is Mango lassi.I had this in my draft ever since summer started but only now did I get a chance to publish this.Its a very simple,quick recipe with full of calories too.Never for dieters but kids will definitely love the colour and the consistency.My son's favourite too. Wash , peel the skin of mangoes and cut cube sizes ,remove the core. Blend in a juicer or blender until smooth. Add the yogurt and sugar to it ,blend again. Refrigerate for 2 hours and serve chilled with ice cubes. 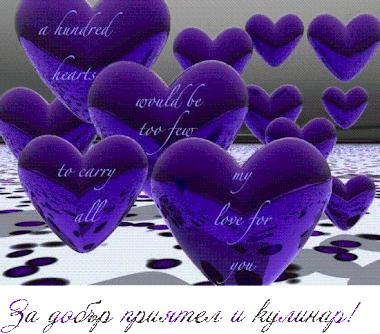 Also,I would like to thank Veronica 's Kitchen for passing me the hundred hearts award and lovely blogger award. I would like to pass it to the following friends who had always supported me and inspired me with their beautiful posts as well. 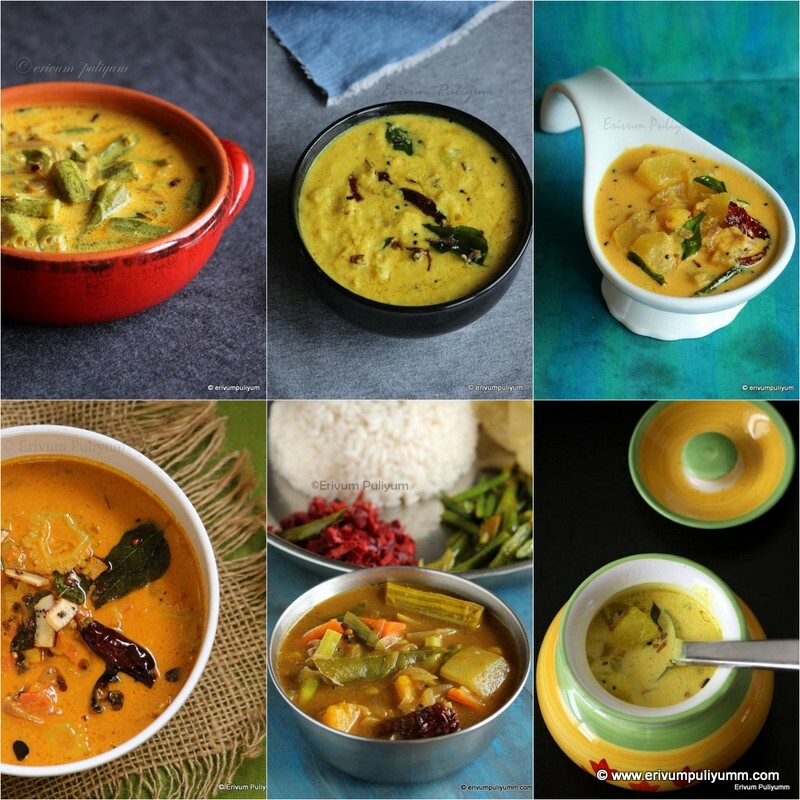 Also , Prathima @ Prathu's Food who shared these awards with me.She has a lovely blog too.I thank her for being so kind to share these awards with me.Grab them friends and add it to your efforts!! 'Ela Ada' is a commonly used malayalam word for steamed soft rice cakes prepared using banana leaf jackets and is filled usually with coconut and jaggery with a touch of cumin powder or cardamom powder.It is prepared either as breakfast or as snack.These days we get ready made ones in the frozen section of Indian grocery stores.But friends,this is a very simple but very healthy recipe for kids as an evening snack.Now,getting banana leaves may be a question in many of my US friends here,right?? 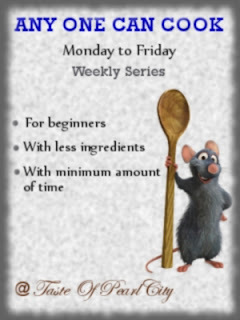 I too had this in my mind,but now am aware that we can get it in the mexican stores here.So, what's stopping you to prepare this oil free,guilt free healthy food ?Go ahead and give a try!! If you have no access to the mexican stores,you can prepare them using the regular aluminum wrapping foil.I tried one with that too; you need to oil the foil and then apply the rice flour dough evenly.However,when you compare the softness its not as soft as the ones cooked in banana leaves but the taste is good. At times you crave for an ela ada in a place away from Kerala,you can adjust a bit right regarding the texture using aluminium foil too,Isn't it? 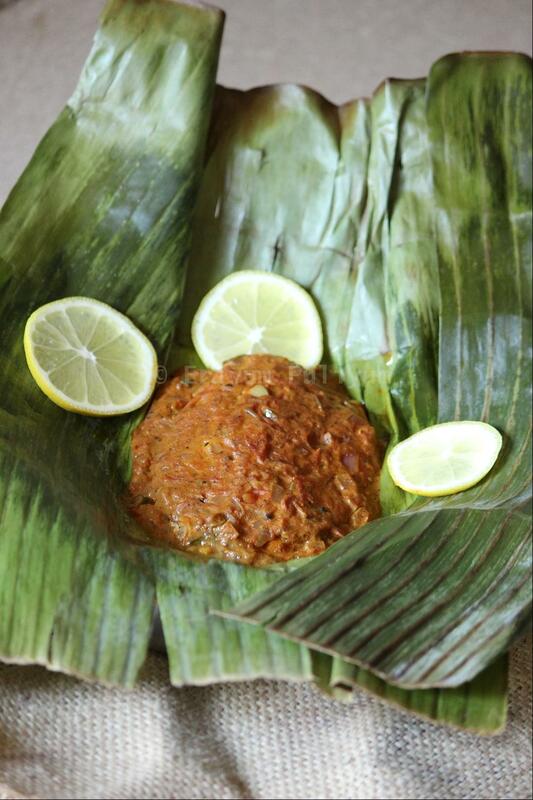 I prepared the ela adas using ripe plantain as the filling instead of jaggery. 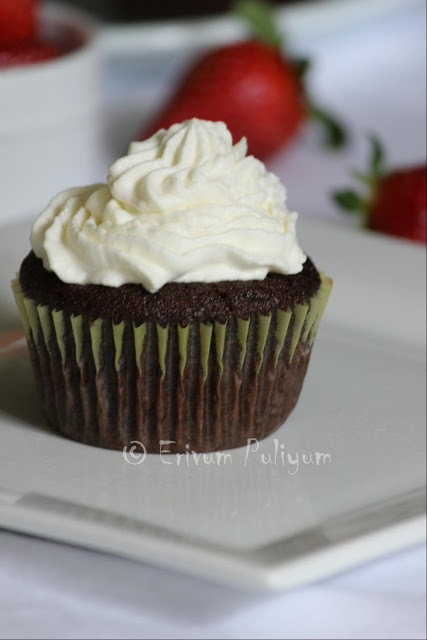 I should admit that it was a big hit like my Plantain Pan cakes and Sweet Plantain Puffs.So not boring much with the write up,just check this out !!! Take the rice flour in a bowl ,add salt.Keep aside. Boil the water in a pan and add slowly to the flour ,make a soft dough like for chapati. Boil the sweet plantains with the skin intact in a steamer or idly cooker. Mash the plantains after removing skin and add the grated coconut ,sugar, cardamom powder. Wash and clean the banana leaves and cut out small pieces. Keep a small bowl ready with water and dip your fingers into it ,take a small ball of dough . Place it in the centre of the leaf and spread both sides.If the dough starts sticking to your hands,apply a small amount of water by dipping your fingers into the bowl. Then ,place the filling on one side and fold the other half on top of it as a jacket. 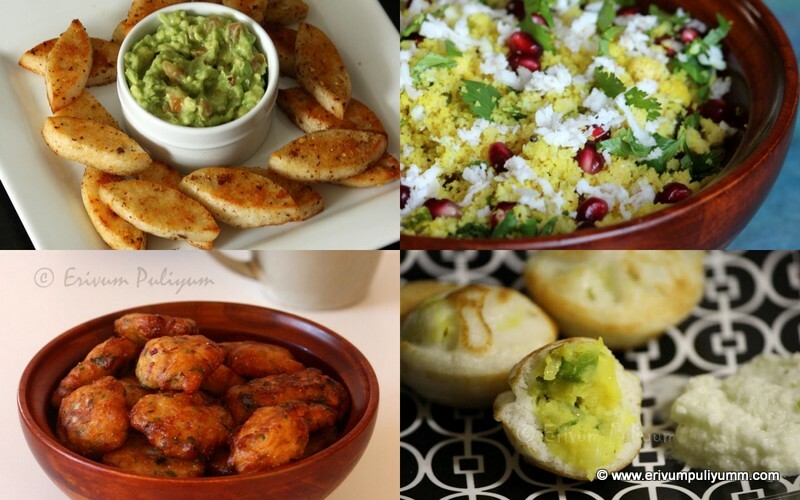 Place an idli cooker or steamer and place the filled leaves into it . Steam for about 10- 15 minutes till the ada start to leave the leaf and there is change in colour of banana leaf. Serve it hot as breakfast or a healthy snack. * If you are using a aluminium foil wrap,then oil it before applying the dough to get the correct texture.